This shouldn’t surprise you reading after HTC’s acknowledgement that they had missed their own deadline for releasing Ice Cream Sandwich to the Thunderbolt, but we wanted to make sure Incredible 2 owners were also kept in the loop. And for those few Inc 2 readers that have yet to upgrade to the next big thing, you will be waiting longer for Android 4.0. 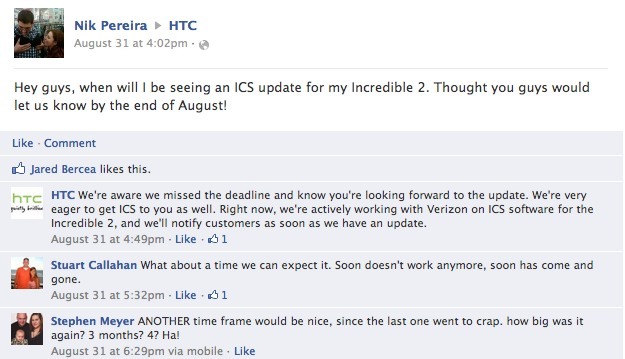 On Friday, HTC also made it known that they are actively working with Verizon to get ICS out to the Incredible 2. They will notify us as soon as they are nearing completion. Tuesday Poll: September Tech Announcement You are Most Excited About?